Scientists at the University of Oxford say a hangover from evolution could help explain why humans get so much shoulder, hip and knee pain. And if current trends continue they predict the humans of the future could be at even greater risk. They studied 300 specimens from different species spanning 400 million years to see how bones changed subtly over millennia. The changes came as man began standing up straight on two legs. Other researchers have noticed similar evolutionary quirks in humans. Some people prone to lower back problems, for example, could have spines closer in shape to those of our nearest ape relative - the chimpanzee. Dr Paul Monk, who led the research at the Nuffield Department of Orthopaedics, Rheumatology and Musculoskeletal Sciences, was interested to explore why patients in his clinic came in with similar orthopaedic problems. "We see certain things very commonly in hospital clinics - pain in the shoulder with reaching overhead, pain in the front of the knee, arthritis of the hip, and in younger people we see some joints that have a tendency to pop out. "We wondered how on earth we have ended up with this bizarre arrangement of bones and joints that allows people to have these problems. "And it struck us that the way to answer that is to look backwards through evolution." The team took detailed CT scans of 300 ancient specimens housed at the Natural History Museum in London, in Oxford, and the Smithsonian Institution in Washington. Bringing the data together, they were able to create a library of 3D models, and spot changes to the shapes of single bones over millions of years. 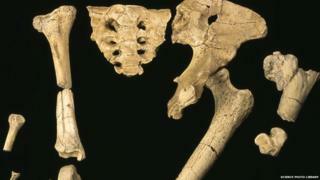 As species evolved from moving around on four legs to standing up on two, for example, researchers say the so-called neck of the thigh bone grew broader to support the extra weight. And studies show that the thicker the neck of the thigh bone, the more likely it is that arthritis will develop. Scientists say this is one potential reason why humans are susceptible to so much hip pain. The team then used their data to hazard a guess at the shape of human bones 4,000 years in the future - although they admit there are many uncertainties in future times that could not be accounted for. Dr Monk said: "What is interesting is if we try and move these trends forward, the shape that is coming has an even broader neck and we are trending to more and more arthritis." In the shoulder, scientists found that a natural gap - which tendons and blood vessels normally pass through - got narrower over time. The narrower space makes it more difficult for tendons to move and might help explain why some people experience pain when they reach overhead, say the scientists. Image caption The shape of the shoulder changing over time. Using these predictions, the researchers suggest joint replacements of the future will have to be re-designed to accommodate the evolving shapes. But they say it is not all bad news - the right physiotherapy and working on maintaining a good posture can help mitigate some of the downsides of our design.